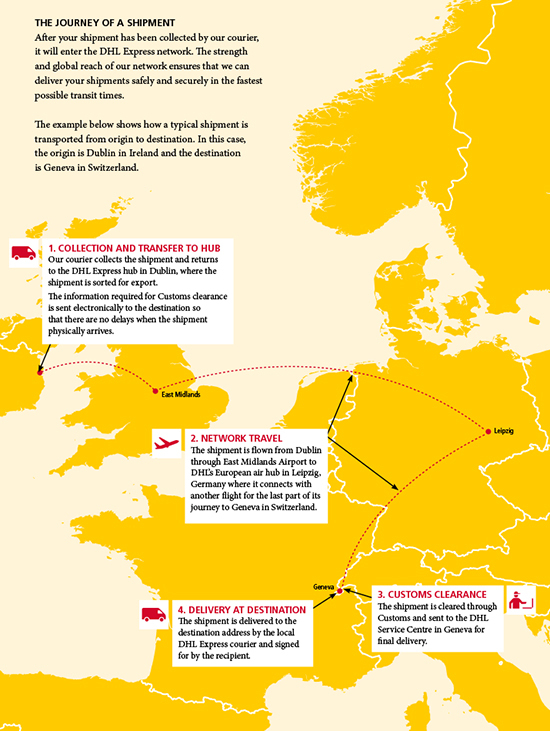 All you need to know about preparing and sending a shipment with DHL Express. Once your shipment is ready to go, the next step is to arrange a collection. Most customers do this via their DHL Express shipping tool but you can also book a collection by calling our local Customer Services team on 1890 725 725 (+353 1 870 0790 if you’re calling from outside of the Republic of Ireland). Our courier will come to your address to collect your shipment and the journey to its final destination will begin. You can follow the progress of your shipment at all times using one of the various tracking tools available. With DHL, speedy delivery, reliability and matchless customer service are a given. But with a DHL account you’ll enjoy even more benefits. After your shipment has been collected by our courier, it will enter the DHL Express network. The strength and global reach of our network ensures that we can deliver your shipments safely and securely in the fastest possible transit times. The example below shows how a typical shipment is transported from origin to destination. In this case, the origin is Dublin in Ireland and the destination is Geneva in Switzerland.